Today I have a really special giveaway for you guys! As a way of saying thank you for all of the support that you guys have given Matt and I over the last year I really wanted to do something to show how much it really means to us. I wish I could buy you all a little present to say thank you. But that is obviously impossible. So instead today we have decided to giveaway a pair of HUNTER BOOTS to ONE lucky reader. I am so excited to give a pair of these away because they are my favorite boots. I have a couple of pairs and I wear them all of the time. So to enter use the Rafflecopter widget below. You have to complete ALL of the entry requirements to be eligible to win. The giveaway is going to end on Christmas Eve at midnight. Once a winner has been picked I will email that person and we will discuss which color you would want them in, your size, address and all of those fun details so I can get you the boots ASAP. Again, I just really want to say thank you from the bottom of my heart for supporting my blog and everything that we have been through this past year. It really means so much to me that you guys read my blog. And when I was going through a tough time this year it really blew me away how much support you all gave me. I am so appreciative. Thank you so much! So good luck! And don't forget to complete all of the entries below! Such a fun giveaway! Thank you! This is amazing!! I would love a pair!! Ive always loved them but they are out of my budget..I have been following u for a while bt it feels extra special cuz im expecting too! We r like 4days apart! :) God bless u n ur family!! I've always wanted a pair! You are too kind Jade! Those boots are gorgeous! Thank you for the opportunity! Thank you!! This is the best giveaway ever!! This is truly so kind of you! Jade - this is such an amazing giveaway! But I don't have twitter. =( Am I not able to win then? Such a great giveaway! I've always wanted a pair of Hunter boots too LOL. I've been following for awhile and love how genuine you are. God Bless! entered! can't wait to see who wins! so much love for you and your growing family!! So sweet of you!! I'm so excited for you to have your little one! Best Christmas gift ever!! Thanks for the giveaway! I can't wait to hear that your little lady has arrived! Love this giveaway!!! I've always wanted a pair! Thanks so much for this opportunity, I love your blog! This is amazing! Fingers crossed! We love you, Jade! Can't wait to see the little one! I am crushing on your outfit! Merry Christmas!! Thank you so much for the opportunity! And thank you for all the work you do posting your outfits! I'm so glad I found your blog! God Bless you as you being your new journey as a mother! This is such an amazing gift to give you a follower of yours! You're so sweet. I would love to win! I'm a sophomore at U of Iowa and being that of a broke college student these would be a Christmas miracle, and I can show them off around campus :) I've been following you all this year and I've been keeping up with your beautiful pregnancy. I'm very excited for you to have your baby girl <3 Well I've entered, my fingers are crossed, and I'll be anxiously waiting to hear who the winner is. Thank you again! Thank YOU for the giveaway! You are an amazing blogger! Absolutely fabulous pair of boots! Love your Hunter boots, and your fabulous giveaway!! These have been on my wish list for a little while. Keeping my fingers crossed. Hope you have a great weekend!! Wonderful thank you! I love the red boots with your cream outfit! I would never have thought of that! They are lovely! Thank you for the chance! 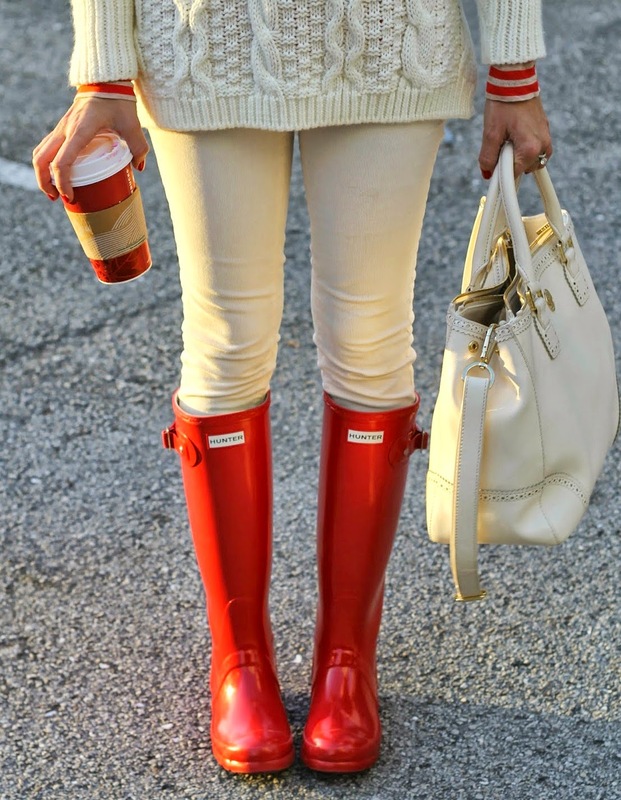 Love the Hunter boots in red especially, so festive and adorable. Such a great giveaway for this Seattlite! Loving that you are expecting a baby girl, just had one and hope to see her baby outfit of the day's sometime! Awesome giveaway! So generous of you. I've always wanted a pair! What a great gift, thank you for the opportunity! How fun! … Merry Christmas to you and yours! Love them...Thanks for sponsoring such a great giveaway! Thanks for the giveaway! I'm crossing my fingers! You are such a style inspiration and always SO gorgeous! I just love your blog. It's definitely my favorite :) thank you so much for this opportunity! Can you give outfit details for this post? Thank you and Happy New Year! !